So I have this fear - and that fear is of pies - pies from scratch specifically. I don't like making pies because my experience with homemade pie dough has been horrific. I never get it right and I just don't have the patience right now to get it right. Cooks on TV make it look so simple right?? I do want to get it right one day, but for now I thought I'd take a step back and practice with this super easy and DELICIOUS chocolate pecan tart. This is the kind of tart that you make when you baking is not your thing - yet you have been charged with bringing dessert to your holiday gathering, or the kind of tart you make when you have very little time to pull a dessert together. It takes about 15 minutes to make and it's made with a store-bought pie crust and pantry staples. AND it's so good. It's simply a flakey, crisp crust with a gooey chocolate-y center that's topped with pecans that develop this wonderful roasted flavor as they bake. So good. It's just a simple, quick dessert that would be perfect for your holiday table. 1. Preheat the oven to 350 degrees. Make sure the rack is in the center of the oven. 2. Lightly flour a surface and place to dough on the surface. Lightly flour the top of the dough. Roll out the dough to about 1/8 inch thick. It should be about 9.5 inches in diameter by the time you finish rolling it out. If you aren't used to rolling out dough, don't fret about this step! It only takes a few rolls and your are done! 3. Wrap the dough around the rolling pin and unwrap it over a 9 inch tart pan (I love this one and its price!). Lightly press it into the bottom and sides of the pan. Trim off any leftover dough that hangs over the pan. Place the tart pan on top of a rimmed baking sheet and set aside. 4. 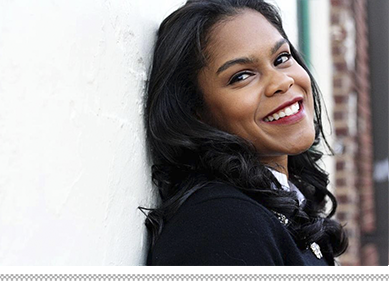 In a large bowl, whisk together the eggs, granulated sugar, brown sugar, unsalted butter, vanilla, and bourbon. 5. Sprinkle the chocolate chips evenly over the tart shell. Pour the filling over the chocolate chips. 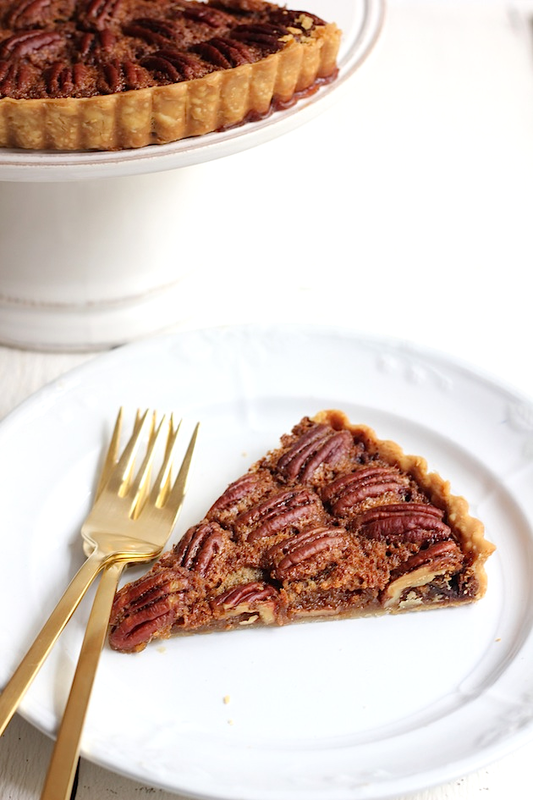 Arrange the pecan halves over the filling in any pattern you like. I arranged them in a circular pattern here. Either way, just make sure they are spread out in one even level so that they cook properly. 6. Bake for about 45-55 minutes, or until the filling has set and the dough has browned and has pulled away from the sides of the pan. 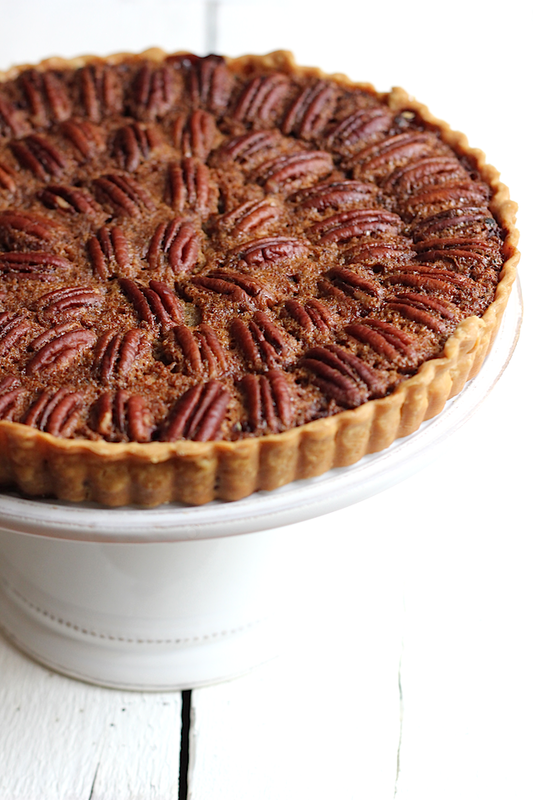 If the pecans start browning too fast, then lightly cover the tart with foil until the tart finishes baking. I didn't have to do that, but just in case! Let the tart cool completely before removing it from the pan. 7. I think this is best served warm with a side of ice cream and/or whipped cream, but it's good at room temp, too! Oh my. This sounds divine. 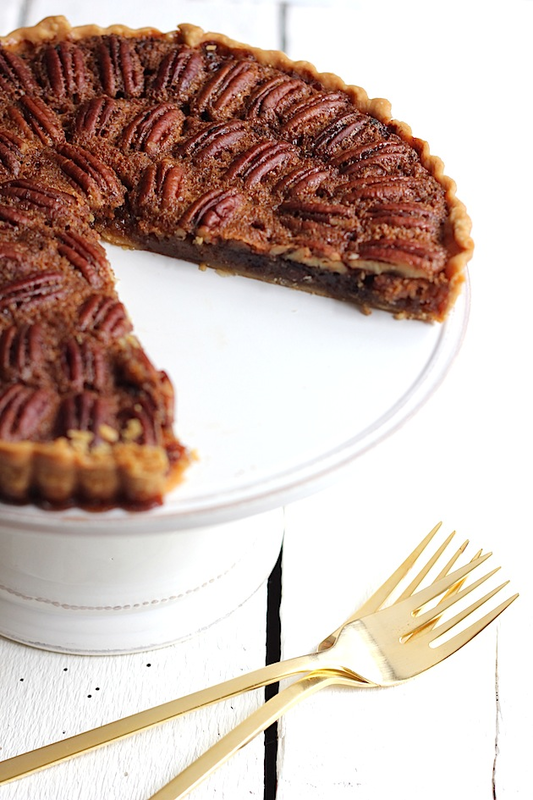 A perfect spin on pecan pie I'd say!